HH Gopal Krsna Goswami Visit - This Week! ~ The Toronto Hare Krishna Temple! 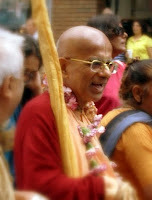 HH Gopal Krsna Goswami Visit - This Week! This weekend, we will have the great opportunity to have the association of HH Gopal Krsna Goswami! As part of his annual visit to Canada, he will be enlivening all of us through the discourse this Sunday Feast as well as Lord Balarama's Appearance Day. HH Gopal Krishna Goswami, a senior disciple of Srila Prabhupada, is presently GBC of many countries throughout the world including parts of Russia, America, Canada, Europe, Asia, Africa, and India and has many disciples world wide. HH Gopal Krishna Goswami was living in Toronto when he first met with Srila Prabhupada in June 1968 and soon after, took formal initiation from him. He is actively spearheading and involved with many of ISKCON projects globally and we are very excited to be welcoming him for his annual visit to Toronto. Please join us this Sunday for what will be a riveting discourse! I believe he was in Montreal when he met Srila Prabhupada in 1968 since Srila Prabhupada was not in Toronto at that time.